Nothing says thank you more then a gorgeous and colourful bouquet of mixed fresh flowers! 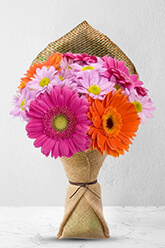 Send these beautiful Gerberas and Chrysanthemums to show just how much you appreciate the person who has helped youThe vase in the image is not included, however for a lasting impression we recommend the Standard Vase to perfectly complement Fruit Salad. The person that I sent the flowers to said they were beautiful. They were delivered on the day I requested. Delivery arrived as scheduled and in great condition. It was nicely arranged and fresh. The receiver loved the arrangement. Beautiful flowers very quick delivery. Very satisfied with the service & flowers. Thank you. I was very happy with the service and the flowers I sent to my mum and my daughter, although my mums didn't arrive until early evening she said they were lovely.